If they had played it differently Leeds United would be preparing for a high profile FA Cup tie against Arsenal this weekend, but instead they have to make the long travel to Ipswich as they look to continue their promotion challenge in the EFL Championship. A 2-1 home victory over Bristol City got Garry Monk’s men back on track on Tuesday night, but they know it will count for little unless they can follow-up against the Tractor Boys. A win would go a long way to justifying the decision to go with such a scratch side at Sutton in the FA Cup and prove that maybe it was worth sacrificing the cup this year with what is at stake in the league. The games have been coming thick and fast lately and the strain has been showing with four defeats in six matches before the Bristol success. Unusually United have now won all their midweek matches in 2017, but have lost for four weekends on the spin, however, so they will be more than eager to avoid that number rising to five at Portman Road. Their cause has been aided with Ipswich’s star performer, Tom Lawrence, picking up a suspension to rule him out of the game. The 23-year-old Leicester City loanee has been the one shining light in an otherwise fairly dismal season for Ipswich with 10 goals and five assists and eight of those goals coming since the turn of the year. Ipswich boss Mick McCarthy was frustrated by the booking he picked up in Tuesday night’s game at Brighton, but is not writing his team off for the visit of a Leeds team he supported as a boy after encouraging recent displays. He said: “It’ll give a chance to somebody else, as disappointing as it might be. “Quite clearly we’re on an upward curve, that’s evident to everybody. “I did say openly that we’ll probably play well against these sort of teams and get more points than we did from supposedly easier games. Ipswich drew 1-1 with second-placed Brighton on Tuesday night after beating big spending Aston Villa and drawing with fourth-placed Reading in their previous two games. McCarthy has put some of that improvement down to bringing Toumani Diagouraga in on loan from Leeds in midfield. They will face a United side boosted by their attacking display, particularly in the first half, against Bristol City, although recent history is against the Whites as they have lost on six of their last seven visits to Ipswich. They have skipper Liam Bridcutt available again after suspension and he is likely to go straight back in the side with Eunan O’Kane not really taking advantage of his chance in the captain’s absence. 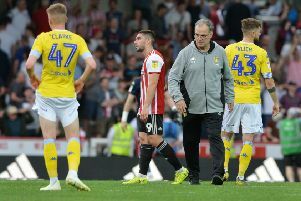 Elsewhere, head coach Monk has some decisions to make on who to play in the wide roles with Hadi Sacko, Kemar Roofe, Mo Barrow, Alfonso Pedraza, Stuart Dallas and Souleymane Doukara all having a go on the flanks in recent weeks without any of them quite nailing down a spot.